Queens junior Marius Kusch continued prove his sheer dominance by putting himself in the lane four position in tonight’s 200 fly final. Should Kusch emerge victorious tonight, it will mark his third NCAA Division II title of the meet as he won the 200 free last night and the 200 IM on night one. For complete results of today’s prelims, click here. Check below for event-by-event coverage of day three preliminaries of the 2018 NCAA Division II championships. Cal Baptist freshman Topcu Buse will take the lane four spot in tonight’s A final with her 4:49.40 while West Chester’s Georgia Wright (4:50.86) and Lindenwood’s Simone de Rijcke (4:51.85) will flank Buse in lanes five and six, respectively in the final. Rounding out the A final will be Bridgeport’s Annagrazia Bonsanti with her 4:54.13. Indianapolis freshman Adam Rosipal earned his number one spot with a time of 4:23.66 while Simon Fraser’s distance-duo of Hamill Mackenzie (4:23.99) and Rolando Hernandez (4:24.80) followed behind. Taking the lane eight position heading into tonight will be Tim Samuelsen in 4:27.51. Oklahoma Baptist’s Marquez Celina swam a 53.60 to earn her a top seed in the A final while Drury’s Yekterina Rudenko turned in a time of 53.89 to earn the second spot heading into tonight. MSU-Moorhead’s Erin Sullivan took third with her time of 54.39 while taking the eighth spot in tonight’s final will be LIU’s Karis Fuller (55.12). Queens senior Paul Pijulet swam 47.11 to take his lane four spot heading into tonight’s final with Giulio Brugnoni hot on his tail with a 47.13. Indy’s junior Rodrigo Codo Berti was not far behind in a time of 47.28. Drury added some ammunition to their heavy breaststroke artillery by placing Zuzanna Chwadeczko (1:00.25) and Bailee Nunn (1:00.49) in the middle of the pool for tonight’s A final. Carson-Newman’s Maggie Melhorn touched in 1:01.15 for the third seed. Before tonight’s A final, a swim-off will be required between Fresno Pacific’s Daria Belova and CSU East Bay’s Claire Beaty who each touched in 1:02.08. 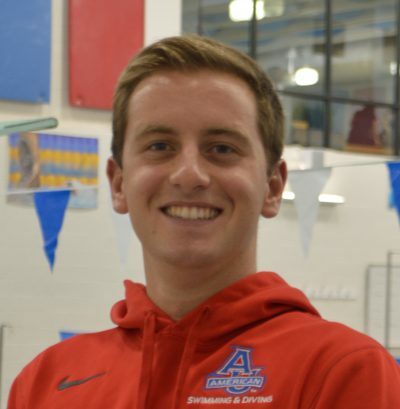 Drury’s Andrea Bazzoli earned the rights to lane four tonight with his 52.68 which was good enough to get ahead of Saint Leo’s Henrik Dahrendorff who put up a 53.06. Lindenwood’s Justin Winnett swam a 53.74 to earn the third spot. Cal Baptist’s Eric Tolman took eighth going into tonight with his 54.14. Simon Fraser’s Jessie Gibson swam a 1:57.99, which gave her the lane four spot tonight with a trio of Queens swimmers behind her. Leading that trio is Mckenzie Stevens (1:58.20), followed by Georgia DaCruz (2:01.36) and Josephina Lorda (2:01.41). Rounding out tonight’s final heat will be Simon Fraser freshman Kaleigh Sharkey who swam a 2:01.92. Queens junior Marius Kusch swam the fastest out of all the preliminary heats with his time of 1:44.40 with Findlay senior Janko Radmanovic took second in 1:45.45. Lindenwood’s duo of Cristian Vasquez (1:46.42) and Matheus Isidro (1:47.06) are sitting third and fourth, heading into tonight. Taking eighth for tonight’s final was Southern Connecticut’s Leonardo Laporte in 1:47.81.